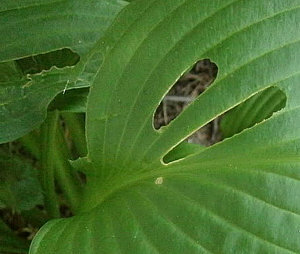 There are some insects that find hostas tasty. They damage the leaves but none are a real threat to the plant. Most obvious are caterpillars, which cut long rounded strips out. It isn't know how many types of caterpillars like hosta leaves, or whether they are moths or butterflies. They may be gone and cocooned up by the time you see the damage. Black vine weevils are active at night and cut small irregular notches out of the edges of the leaves. Leaf cutter bees cut larger rounded pieces from the edges. Aphids may be on the back of the leaves making lots of tiny brown spots. An outbreak of an unidentified thrip caused faint spots on leaves. Grasshoppers occasionally attack hostas too, and sowbugs/pillbugs do as well. There are a number of insecticides that will work to control any of these but one must weigh killing bad bugs against killing butterflies and bees as the insecticides do not discriminate. In the Garden: Bt products will control caterpillars, but without identification may kill wanted butterflies as well as harmful moths. Imidicloprid products are effective against many leaf-chewing insects, but should be applied early in the season. In the Nursery: The thrips can be controlled by application of imidicloprid as the plant emerges in the spring.